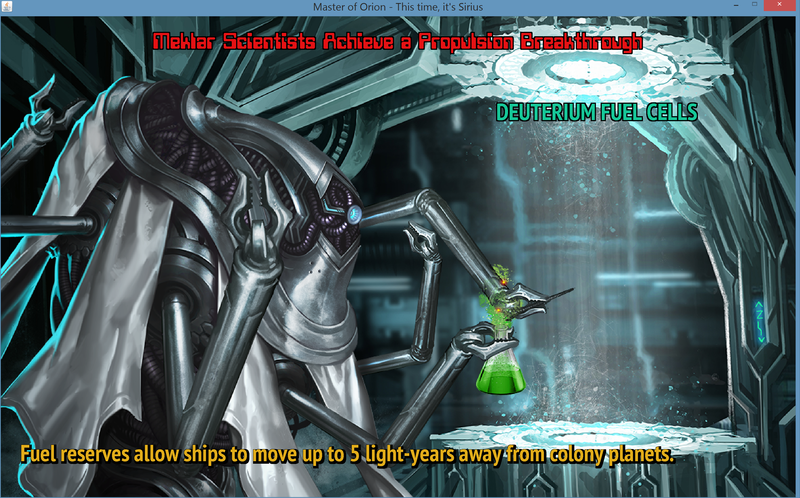 All of the new artwork for the Meklar race is done and (mostly) integrated into the game. All that’s left is for the diplomat image to be integrated but that needs to wait until I have the UIs for the races done. This week I mainly finished up the basic AI responsible for managing colonies, doing research, building ships, managing fleets and generally expanding out into the galaxy to build an empire. This was a necessary prerequisite before I start creating galaxies with multiple competing races. In addition, I wrote some code infrastructure to support the new artwork and the asychronous animations within them. 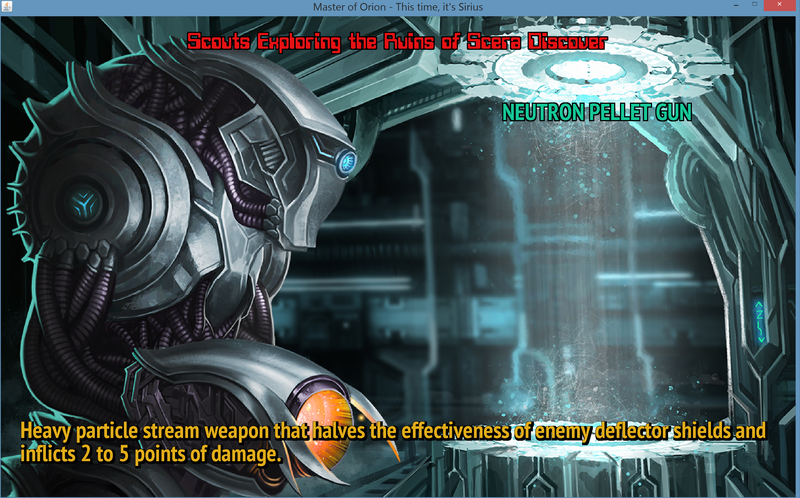 Here are in-game examples of the new Meklar scientist and soldier artwork. Silicoids are next on the list! Please note that new technology graphics are not in the game yet. The plan is to have them show up as holograms in the attached images. Phase 3 has started, wherein the player will be able to play against multiple AI opponents. But before they can be added, I need to work on the AI to instruct the computer on how to explore, defend and colonize systems. Fortunately, a tremendous amount of this work was done in an earlier Java MOO attempt so this portion consists of mainly integrating, testing and improving upon that code. This is well underway. I’ve created an “Auto-Play” difficulty mode in which the AI will play the player’s race. This allows me to easily watch the AI at work and address any problems I’ve seen. I expect to be doing this most of the week, but should get the AI to the point where it efficiently expands throughout the galaxy and develops its colonies. These are all currently working decently, but I need to test them a bit more. 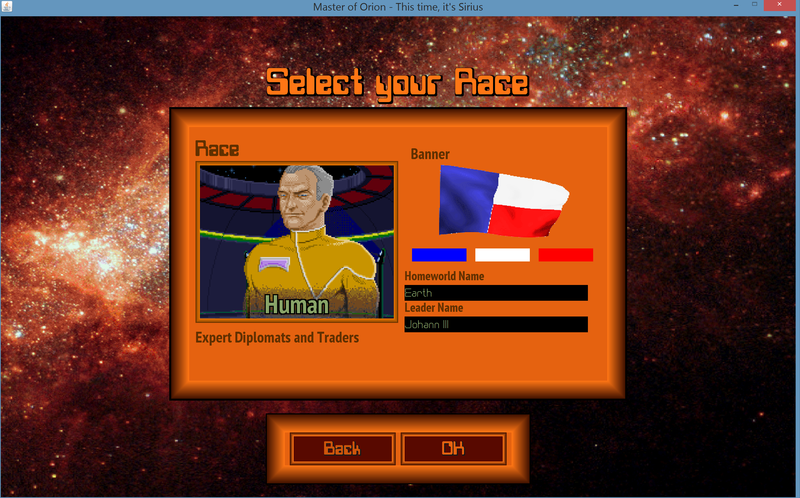 Other AI personalities will eventually be needed, such as a “diplomat” for managing relations with other races, a “general” for determining attack targets during war, and a “ship captain” for managing ships in combat. All of these except the latter should be functional by the end of Phase 3. It’s been a full week of alpha testing and fixes, so it’s time for me to call it done and move onto work for the Alpha 2. This next version will include all of the races and various interactions with them, as well as a lot of new artwork. Of course, other changes will sneak in as time permits. 1. Game gets progressively more sluggish over time, then crashes. Fixed. 3. game suddenly freezing: fixed. 4. No habitable planet in starting range: players will now start with at least 2 systems within colony ship range; only 1 is guaranteed to be habitable. Send scouts first! 3. Button should give visual indication when pressed: fixed. 9. Slider titles should change color when hovering to give indication they can be clicked: they now highlight when hovered. 10. blue ships hard to see on map: the blue color for ships has been lightened noticeably. 11. zooming is choppy: sped up zooming. 1. Game will not start: Java 8 is required. Per Oracle, the oldest supported Windows OS is Vista. 2. Clouds need to rotate faster than planets: no plans to support. This optical illusion does not occur when viewing planets from space! One of the alpha testers accurately reported, “the flag on the setup screen is too shiny”. Yes, yes it was. That was originally just a placeholder image until I could do the flags properly, so thanks for reminding me! The player flags are now much more interesting… 8 different patterns with multiple color settings. Below is an example flag choice. Also, the flag is animated now. I’m getting great feedback from many of the alpha testers and it’s greatly appreciated. The most important issue has been fixed… Java MOO will now scale properly based on your display resolution. This means that if you have a high-resolution display, you will not need to upscale the pixels to play the game. 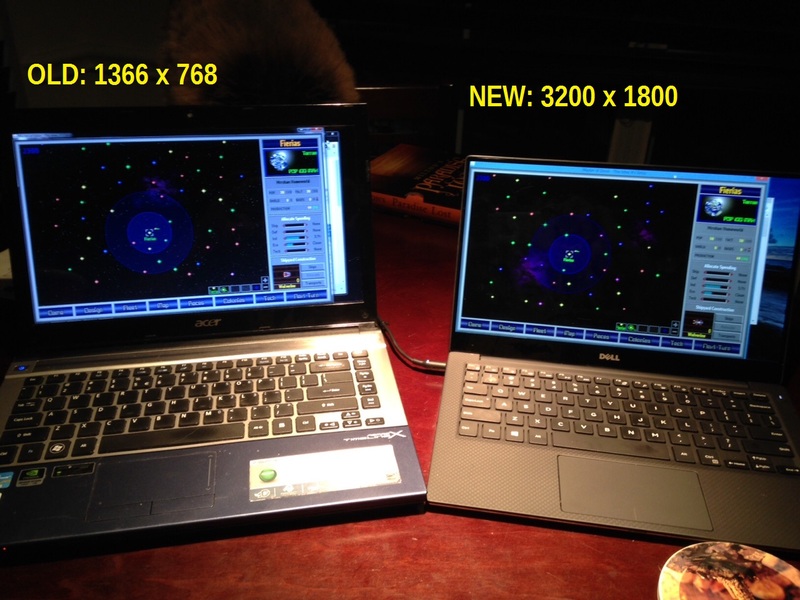 Now, it just so happens that my new laptop arrived on Thursday, a Dell touchscreen with a 3200×1800 display. 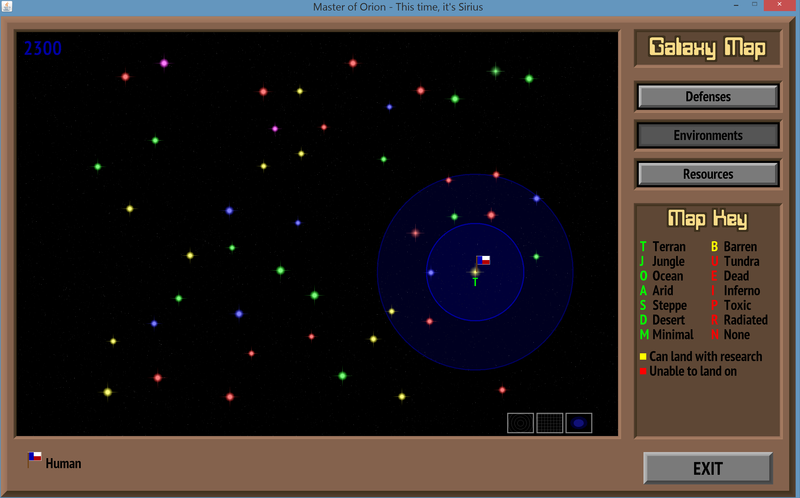 This was intended to replace the 1366×768 display that I was developing the game on. Below you can see that Java MOO now plays properly scaled on both displays. This took about 5-6 hours of refactoring code to work, but I think it is well worth it. Yee ha! I’ve got about a dozen other issues to address from the alpha test feedback before I can start on Phase 3. Most are very minor and some are annoying (but easy to fix). All in all, I’ve been pleasantly surprised that there haven’t been very many complaints! If you signed up for the alpha test, please check your inbox for instructions.